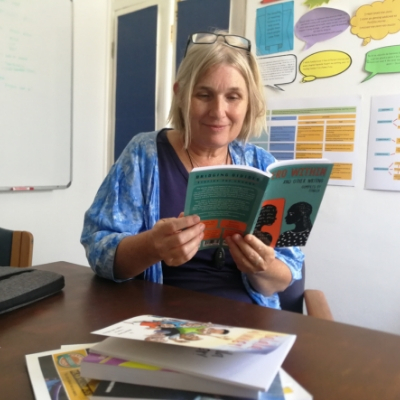 FunDza is excited that its new anthology – Hero Within and Other Writing – is now out and currently being distributed to its Family reading groups countrywide. This beautiful anthology forms a part of its flagship project launched in 2017 – Rights 2.0: Bridging Divides. The project explores the themes of community, gender and information divides using the power of personal narratives to help readers bridge these divides in their lives, using as inspiration values contained within our Constitution. The pieces published on fundza.mobi as part of this project are first and foremost well-written, relatable and exciting. They express the themes of societal divides in a personal way, that creates empathy in readers and draws them in to stories that reflect their own experiences in their daily lives. Not only has FunDza been commissioning professional writers and mentee writers to produce short stories on these themes, it has also commissioned young writers to produce blogs that explore divides in our communities, as well as running competitions (such as the My Home, My Hood writing competition) so that the FunDza Fanz can contribute their own writing and experiences as part of the project. Hero Within and Other Writing includes stories and blogs by professional writers as well as essays and poetry by FunDza Fanz writers. It is a wonderful, powerful and moving collection that evokes the stark divides that exist in our communities and our country. The powerful narratives give voice to those who are poor and discriminated against, and are threaded with hope and resistance. Hero Within (the story from which the collection gets its title) by Maxine Jordan, is about a courageous school girl who stands up for herself against her abuser; Sifiso Mzobe’s Faith explores how religion can cause strife in a family, Michelle Faure’s Love Aflame is a lesbian love story against the backdrop of the Knysna Fires. Shorter pieces include blogs around catcalling, in ‘I am Not Your Hello Nice’ and the economic burden in families of ‘Black Tax’, as well as winning essays from the My Home, My Hood competition: ‘A Familiar Stranger in my House’ by Athenkosi Cetyana is about feeling a stranger in your ‘hood’, and ‘We Never Make it To the News’, by Njabulo Goba is about growing up in a gangster, gun-ridden township in KZN. The anthology is also scattered with some beautiful emotive poetry, from ‘No Means No’ by Hector Bululu, to ‘I will Rise’ by Sithembiso Ngcasa and ‘Hard to Stay Alive in 7785’ about growing up in Lentegeur in Cape Town. The stories, blogs and poetry in Hero Within and Other Writing have been widely read by FunDza readers and have received such encouraging and positive feedback from ‘This story is very touching’ to ‘Wow – what an amazing story – it felt so real’ to just plain ‘Beautiful’! A big thank you to the Claude Leon Foundation, which has been the major project sponsor, as well as to the Foundation for Human Rights and the 476 Charitable Educational Trust for their support in the development of content as part of this project. The anthology is being distributed to FunDza’s Family reading groups at the moment. But it can also be bought from Loot at the discounted price of R73. So, get a copy by clicking here.